It’s not every day that one is invited to meet the President of the British Fellowship of Hairdressing, who is also an MBE but I am no shrinking violet and so on a sunny morning in the middle of February I arrive on the doorstep of Errol Douglas salon in Motcomb street. The salon itself feels intimate but when you have a chance to walk around you realize that it is laid our over two floors and several languages are floating in the air, as clients are being attended to. Before long a tall and slightly imposing man comes up to me and greets me, before leading me to the chair. He is dressed casually in wool tailored trousers, impeccably white shirt and a mannish cardigan but a long chained necklace hanging from his neck alludes a little to rock’n’roll undertones. Errol appraise me and asks one of his juniors to wash my hair with the products chosen specifically for me. Errol opened his salon in 1998 and many of his clients have remained with him and his team ever since. Renowned for his stunning photographic work, Errol has won several of the industry’s most coveted awards and his work is often featured in the fashion and beauty press. He spends three days a week working in his salon, while the rest of his time is dedicated to participation in shows and seminars globally, presenting his hairdressing skills and creative techniques to a wider audience. In 2008 Errol received an MBE for services to hairdressing from her Majesty Queen Elizabeth ( and I was cheeky enough to ask Errol to recap the ceremony for me, which he kindly did – there is nothing like the pomp and ceremony of the British traditions of Monarchy-one of which is not to serve alcohol while you wait, just water ). On the day that I meet Errol he is getting ready for London Fashion Week, immersed in the mood boards in his downstairs office), clearly relishing the opportunity to unleash his creative powers, while guided by the vision of designers. He has already done ‘testing’ for four shows and his week has been full on, with no sign of respite, yet he is calm and un-rushed. One of the first things that surprises me about Errol is how he talks to his juniors. It is no secret that juniors are often treated like annoying puppies, at best,the feet, in many of London’s top hair salons but Errol is different. He involves his juniors and teaches them with patience and determination. Jo, the young girl who washes my hair and who has been working in the salon for seven moths, is going to accompany Errol for the fashion show on Sunday. Yes, Errol has years of experience and stature but he seems to take great pride in his job, as well as teaching his team, without the need to resort to sulking or acting God-like. When it comes to his clients, Errol says that there is a great mix of nationalities, from Russians to Brits with French and Japanese thrown in the mix as well. It’s wonderful to sit in a hairdresser’s chair and hear one stylist speak bullet-fast French, while another one conversing in quite Japanese. The whole salon has a chic but laid-back vibe, with everyone getting on with their job and making sure the client gets what she comes to the salon for. Errol was born and raised in East London and tells me that from as long as he could remember ( four or five years of age ) he wanted to be a hairdresser. He was always interested in women, fashion and communication, thus opening his own salon allowed him to combine his passions ( including a great eye for photography – the photos on the salon’s walls wouldn’t be out-of-place in the coolest galleries and draw my admiring glances ). Errol says that it is impossible to be a good hairdresser without communicating well and making sure that you understand what the client came to see you for, yet he also strives to break barriers, from working with all kinds of hair ( Afro hair is very different to let’s say Scandinavian hair ) to the design and layout of the salon. His clients also vary in age and that requires additional skills as well. Both of Errol’s brothers are academic, hence he is the only ‘creative’ person with flair in his family. Errol’s parents were quite strict & and weren’t at all happy with Errol’s choice of profession to start with and yet he got a saturday job in the salon aged 13, in order to learn and achieve what he wanted. He is now a father of three ( his kids ages range from 13 to 18 ) and while none of the children as yet have the plans to follow in his footsteps, he tells me with unmistakable pride that his daughter is keen to do fashion photography. Family has given Errol roots and stability, so for many years he has been willing and able to give back, by way of mentoring young people and sharing his skills and years of experience. Errol’s salon is a working salon an d everyone is allowed and encouraged to expand their skills – after all, as soon as you stop learning you might as well make yourself redundant. As we talk, with Errol pausing momentarily to think before answering my questions at times, he also worked his magic touch on my hair, putting it in rollers and blow-drying it in sections ( keep an eye on my review of Errol’s line of electrical tools ( ionic hairdryer & Treat /Style Keratin Iron ) with Corioliss, ). Hair is our crowning glory and I was keen to find out what steps can one take ( apart from drinking enough water and eating a varied diet, including nuts and avocados ) in order to make sure that the scalp and as a consequence, the hair is healthy. Errol says that one needs to start with ‘the basics’ of a good shampoo and conditioner. You get the fundamentals right, your won’t fail to notice the results! A good hairdresser will ask you questions about your lifestyle, examine your tone of colour and complexion and will guide you, step-by-step, to the best way to maintain & style your hair at home. The thing is that blow-drying might look easy, it’s another story to try to replicate the process yourself -I should know, as I always start with a good intention but somehow gorgeous bouncy locks that Errol gives me, won’t be achieved by me at home any time soon-as far as I am concerned, some jobs are better left to professionals. For Errol the best compliment he can get is when his clients leave the salon and get the compliments on their hair. Many salons that I have been to in the past feel too corporate, too busy and too manic to have true appeal but Errol made a conscious choice to put a small reception desk ( big ones make most clients feel intimidated ) and a big communal table where clients can sit down to read a magazine, have a drink or examine the photography around them. Before I leave, I notice an elderly chic lady our of the corner on my eye, enjoying a coffee and a glorious young thing talking to her-judging by the body language they weren’t related but both seemed to enjoy their exchange. When Errol switches the hairdryer off & I look at myself in the mirror, I am almost rendered speechless as before my eyes my hair went from a flat ponytail into a mass of shiny & bouncy waves. I feel more grown-up and pretty and luckily for me, with no effort on my part, might I add, my hair looks like perfection not on just that day but the day later as well. Errol also mentions a hair product from one of his friends, James Davis, that protects, hydrates & gently perfumes your hair. We all want to have beautiful, bouncy, shiny hair, no matter what our age and Herra Protect Hair Perfume was not only created in the UK, but fuses several qualities into one lovely product. It contains sunflower extract ( helps protect our hair from UV damage, colour fading, smoke & air-conditioning ), olive fruit extract ( rich in antioxidants ) and a signature epsilon fragrance blend that gently perfumes your hair while complimenting any perfume you already might be wearing. What also sets Errol apart is the respect that he feels and expresses for his peers, in the industry that is notoriously bitchy. When I told my hairdresser that I was going to interview Errol, he smiled and said what a wonderful man he is and asked me to pass on his kind regards – that doesn’t happen often within the top milieu of hairdressing. Talking to Errol I understand why he is so well-respected within the industry – he manages to cut hair, to teach, do photoshoots and editorials, while continuously striving to learn and very generously sharing his knowledge while being down-to-earth and accessible. It is a testament to him that many of the people who work with him as stylists now, started their career as juniors at his salon. Maybe that’s the lesson that we can all take on board-be good at what you do and be generous with sharing your knowledge and skills, especially with the people who might not be as lucky as you are. 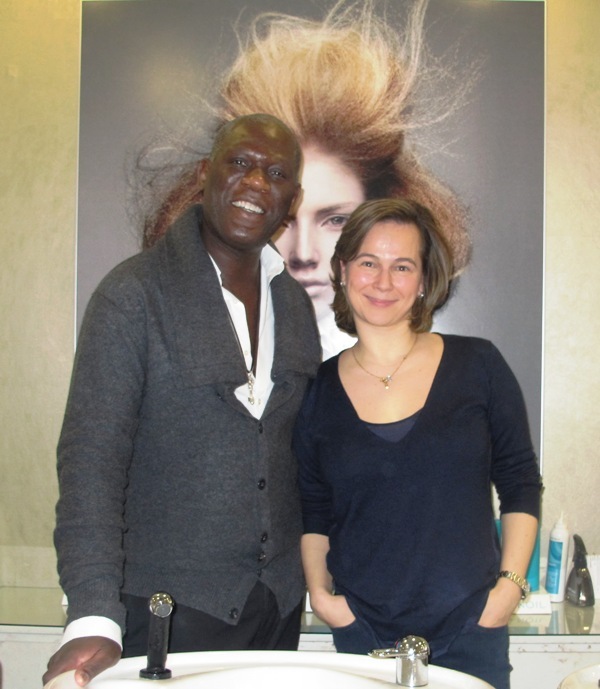 To find out more about Errol Douglas or book an appointment at his salon go to his website here.